With Syria's UN-brokered truce partially holding, government, Kurdish, and rebel forces alike have turned their attention to carving away territory from the so-called "Islamic State" (ISIS/ISIL). However, the rebels also sustained some losses to government forces prior to the ceasefire taking effect. 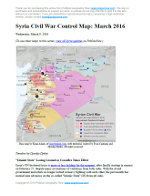 See all this and more on the latest update to PolGeoNow's concise, professional Syrian Civil War control map, which includes a timeline of changes since our previous Syria map report in early February. New since last year: Terrain shading and major highways included on map for geographic context! 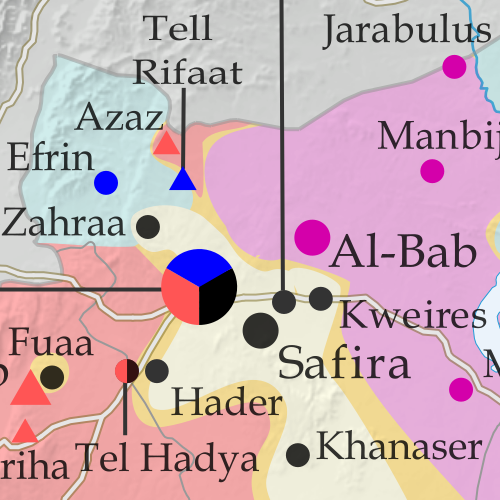 Special symbols indicate towns dominated by rebels of Al Qaeda affiliate Jabhat al-Nusra (the Nusra Front) and by multi-ethnic anti-ISIS Syrian Democratic Forces (SDF). Locations of recent fighting and military operations, including Daraa, Khanaser, Tell Rifaat, Shadadi, the Aleppo Power Plant, and more. Detailed timeline of important events and changes to territorial control since February 10, 2016, compiled by our Syria-Iraq expert, with links to sources.